The JIB's annual Christmas Concert will this year be held on Sat 20th Dec at 7.30pm in the Jedburgh Town Hall. Tickets are priced at £6/£5 and are available from 'From me to you' on the high street, Band members or click Contact to book online. Come along for a foot stamping Christmas cheese feast. 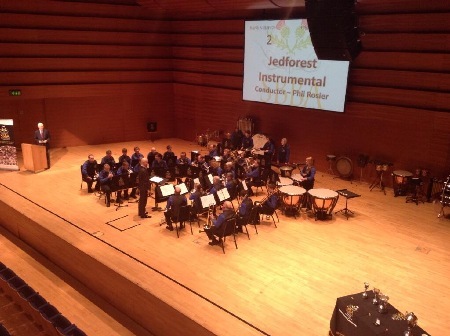 Jedforest Instrumental Band, based in Jedburgh in the Scottish borders celebrated the European Festival of Brass by playing a series of short concerts starting at 10am on Saturday 26th May the first day of the Festival. 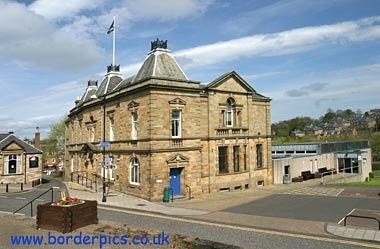 The first half of the first concert was in England, closely followed by the second half in Scotland, the venue being Carter Bar, the border between the two countries. To an appreciative audience of tourists in cars and coaches, as well as a flock of bemused Cheviot sheep, at the viewpoint giving a panoramic view into Scotland, the band played a short selection of traditional and modern music, and handed out leaflets about the Festival. Then to Jedburgh and the bandstand and park created by the band in 2004 to mark its 150th anniversary, where this concert was enjoyed by local people and by tourists visiting the 12th century abbey and the other 130 listed historical buildings in the town, and where they were able to view the exhibition of band memorabilia displayed in a large shop window in the High Street since the previous day. 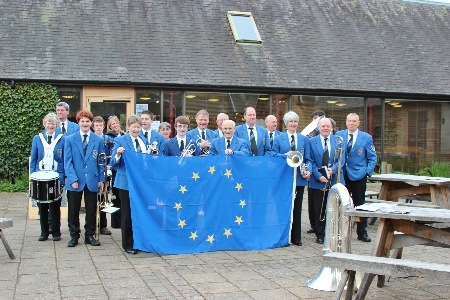 Next to the popular Harestanes Woodland Centre just off the A68, where the staff welcomed the band with a large European Flag to mark the Festival occasion and their appreciation of the concert in the central courtyard. Heading North on the A68 the next port of call was the Milestone Garden Centre at Newtown St Boswells, where the band entertained curious shoppers with Scottish Marches and the Muppets! Two further stops at Leaderfoot Viaduct over the River Tweed, and Scot’s View local beauty spot and the lips were starting to get a little tired. One final appointment lead the band to Melrose and St Mary’s School, where welcome refreshments were supplied prior to playing for pupils and parents from across the Borders who were participating in a sports challenge day. On Sunday 27th April the band commenced with leading a songs of praise service at Jedburgh Old and Trinity Parish Church, with Euphonium player Scott Renwick giving the scripture reading. Finally the band assembled at the foot of the Eildon Hills in the central Borders (Highest 1,384ft) with the aim of climbing all three hills and playing at the top of each. 2 ½ hours later the Eildon Hills had been conquered, and the sounds of the Jedforest Instrumental Band had drifted across the Borders Countryside from all three peaks. Prize for best effort had to go to Scott for carrying his Euphonium practice mute up the hill without realizing it was in his gig-bag! A very busy weekend for the band, which hopefully helped to raise awareness of the commencement of the European Festival of Brass in Scotland, and we certainly had fun along the way! As part of the SBBA's hosting of the European Brass Band Championships, the JIB will be Taking part in a series of events to promote the event. After the Service the band will be holding a 3 peaks challenge -(the 3 Eildons). Meeting at 1330hrs at Bowden Reservoir the band and friends will attempt to climb all 3 of the Eildon hills in the borders. Some instruments may also make it up so another impromptu concert may be heard from the top of these iconic Borders landmarks. Family and friends all welcome! Let's hope the weather is kind to us?? The JIb will conclude it's celebration of European brass banding by holding an open rehearsal on Sun 4th May. The band is busy rehearsing for their forth coming concert and will be led on the night by resident MD Phil Rosier. Come along to see the workings of the band. Doors open at 7pm. A display of band memorabilia has also been placed in a shop window in Jedburgh High St showing old uniforms, instruments and pictures from the bands 160 years of existence. Doors will open at 7pm with the concert starting at 7.30. Tickets are priced at £5/£6 and a fully licenced bar is available. The JIB travelled to Perth with high hopes of a decent performance in this years Scottish Championships. The early start (6am) certainly had made for a quiet bus on the way up!. Playing 'Chaucer's Tunes' by M Ball off a no2 draw the Jib gave a good account of themselves with the band feeling happy after coming off the stage. However, the adjudicators of Alan Morrison and David Read MBE preferred other performances and decided against the band and placed us 7th out of 12. JIb MD Phil Rosier commented "Some great playing today without a doubt and a very good work ethic in the preparation. The process has been very good." The result does cement the bands position in the Second section for 2015 and with a number of youngsters playing in their first championships the band will surely grow in strength. 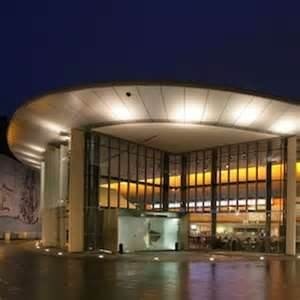 This years Scottish Championships will be held on 8th & 9th March 2014 in Perth Concert Hall. The JIB will competing in the 2nd Section against 11 other bands on Saturday 8th March with the 1st band on stage at 10.00 am. This years test piece is CHAUCER'S TUNES by Michael Ball. As ever the band will be conduced by resident MD Phil Rosier. This years competition will be judged by adjudicators Alan Morrison & David Read. The JIb is calling on all ex players young and old to check under their beds or in their wardrobes and cupboards to see if they have any old instruments or uniforms that may belong to the Band. Instruments are required for our youngsters so that we can train as many as possible for the benefit of the band. Please do not feel embarrassed if you do find any. Feel free to drop them into the hall on Thursdays or Sundays at between 7pm and 9pm or call David Lightbody on 07852230477. The JIB once again took to the streets of Jedburgh on New Years Day to bring in the start of the Bands 160th year. Well over 20 players turned up at 9am to start the march through the streets of Jedburgh only stopping to re fuel with soup and rolls and the odd beverage provided by the generous townsfolk. The Band finally marched up the High street at 4pm to conclude the route with the heavy rain not dampening the bands endeavours.